I get contacted on a semi-regular basis by companies or individuals who want me to share their products with you on this blog. As a rule, I tell most almost all of them, "Thanks, but no thanks." Really, I'm pretty stingy. Unless I have discovered a product first, it generally feels fake to me to share a product on my blog. I want my reviews to be authentic, and I think we all get advertised to enough. There need to be some safe spaces with authentic product recommendations on the internet. You know what I'm sayin'? So about that. . . 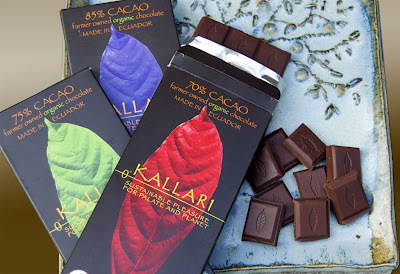 I was contacted several weeks ago by a representative of Kallari chocolate. My initial reaction was to just write a quick reply - "No, thanks!" but as I read more about the product as well as this New York Times article, I thought this was one product that - if for no other reason than the ethical processing of it - deserved a blog post from me. I (happily) accepted a free sample of chocolate so that I could reasonably review its taste for you all here. "Fresh and Ethical Sourcing – We are cacao growers that make gourmet chocolate. Other chocolatiers pay a living wage – we own our chocolate and pay ourselves an income higher than the minimum wage in Ecuador for our work in bio-diverse cacao groves. Rainforest Conservation and Cultural Preservation – We retain most of our farms in primary and secondary rainforest, with an average of 1.5 acres of cacao planted per family, less than 2% of our total territory. This allows us to earn a living and provide for our families without sacrificing natural resources or forgetting our cultural traditions." After my sample arrived in the mail, I started to look through the recipes on Kallari's website and elsewhere. I considered making a Sachertorte (a Viennese culinary delight served in the Sacher Hotel across from the Opera house.) But, I settled on using my chocolate samples to make a South American treat to match the chocolate from Ecuador: Alfajores. Melting the Kallari chocolate in my makeshift double boiler. The chocolate melted very evenly and beautifully. The Kallari chocolate was perfect for dipping. The color and taste was rich and even - no dry white streaks you see in cheap chocolate as it hardens. Even though the chocolate was quite dark, it really wasn't bitter, and it certainly wasn't waxy like the Nestle chocolate chips we usually use. It reminded me of some of the fine chocolate I had tasted on my study abroad in Austria. This chocolate is high quality, delicious stuff. I still have one more bar. I'm saving it for our 5th anniversary that is coming up on Thursday for chocolate and crushed-almond dipped strawberries! I'm drooling just thinking about them. The tagline on the chocolate bars is "Sustainable Pleasure for Palate and Planet." Now that I have read about AND tried this chocolate for myself, I couldn't agree more. And the Alfajores? Fabulous. Even better the second and third days because the Dulce de Leche soaked into the cookies, so they became more caramely and chewy. Soo yummy! I'll definitely make these again. Maybe for an all out Ecuador-themed family culture night? If you want to learn more about Kallari, you can check out their website or their facebook page. They are running a kickstarter campaign to be able to produce chipped chocolate for baking. You can read more about that here. Please Note, in case you didn't catch it: I was provided 70%, 75% and 85% chocolate bars to facilitate this review. The opinions expressed are honest and my own. What's your favorite treat to make with high quality chocolate?